Although we've reviewed several iterations of the Triangle Antal, the largest model in the Esprit Ex series, this is the first Altea to come our way. 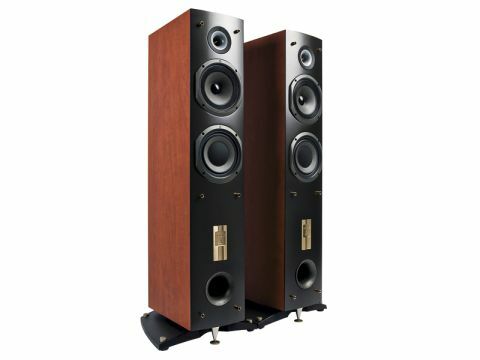 It's the smaller of two floorstanders in the company's least costly range, though its £1,200 per pair price tag is the result of some significant recent rises – when we reviewed the larger Antal Ex some eighteen months ago, it cost just £1,125 per pair. Although the Altea Ex looks purposeful enough, with its three drive units mounted in a solidly built and braced enclosure, it's not the most attractive speaker around. It has a slightly curved dark charcoal painted front panel and a rather indifferent vinyl woodprint, in cognac or black, covering the other faces. A two-and-a-half-way design, the bass driver is loaded by a large flared front port and its 120mm fibreglass diaphragm is reinforced by a large dust cover. In the Triangle tradition, the bass/midrange driver has a flared paper cone diaphragm roughly 112mm in diameter, terminated by a double-S fabric surround, and this in turn is loaded by a small rear port. The 19mm tweeter is Triangle's TZ2500 horn-loaded design, which the company claims offers superior crossover integration, because the horn mouth is larger than a conventional dome. It sits on a proper damped-steel plinth, which looks good and provides excellent stability. There are five points of floor contact here – four rather pretentious-looking 20mm spikes at the corners of the plinth lack any lock-nut arrangements and, therefore, tend to wobble rather easily. A large centre-front cone to earth the front panel is fitted with a captive disc, which will work very well on wooden floors, but is unlikely to pierce a carpet. Connection is via twin terminal pairs. The in-room measurements made it abundantly clear that this speaker should be kept well clear of walls, but notwithstanding this observation and in spite of its two ports and bass drivers, the overall character is a shade thin and lightweight. While it's true that the bass lacks a little warmth and authority, its timing is good and it's bouncy, quick and generally informative, if somewhat understated. As with other Triangle designs, the real strength here lies in its expressive and dynamic midrange and top end. This is certainly lively and engrossing, but also has a tendency to 'shout' when the volume control is turned up high, partly because of a general lack of smoothness, but also because the restrained bottom end leaves the upper half of the audio band sounding a little exposed. Image focus seems pretty good and there's little evidence of enclosure colorations here. While the Altea Ex is always entertaining and involving, with fine voice articulation, the lasting impression is of a somewhat untidy sounding speaker that doesn't, perhaps, do quite enough to disguise the kind of limitations that are inevitable at this sort of price.